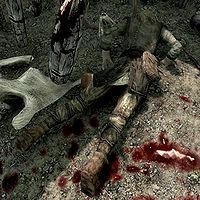 High Elves are unnamed and deceased High Elves scattered around Skyrim. 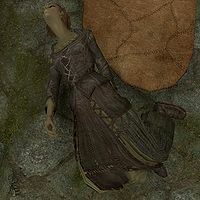 These dead High Elves are female citizens who wear randomly determined farm clothes (7 variants) or a belted tunic and random boots (4 variants). They also have a 50% chance of wearing a random hat (3 variants). They have a 25% chance of carrying a lockpick and/or a small amount of gold. Within Pinewatch, to the left after passing through the secret corridor leading into the bandit hideout. Within Fort Greymoor Prison, situated in a novice-locked cell. Located at the bottom of a spike pit trap within the second zone of Redwater DenDG. These dead High Elves are male citizens who wear randomly determined farm clothes (7 variants) or a belted tunic and random boots (4 variants). They also have a 50% chance of wearing a random hat (3 variants). They have a 25% chance of carrying a lockpick and/or a small amount of gold. Within Fort Dunstad Prison, situated on top of a table on the top floor, alongside a dead skeleton. Located inside Halted Stream Camp, in the spike pit trap, alongside a dead deer.